Despite some leaks, the new McLaren Super Series (also referred to as the 720S) has not been officially revealed yet. Though McLaren did reveal some new info today which details what we can expect performance-wise from their new mid-range super car. The major news is that all second-gen Super Series cars will have a new 4.0 liter twin-turbo V8 engine. Dubbed the “M840T”, the new engine has a slight bump in displacement over the 650S’ 3.8 liters. While official power numbers haven’t been revealed (we’re guessing its going to be above 700hp), McLaren promises that the M840T can slingshot the new Super Series car down a quarter mile in 10.3 seconds from a standing start. Dominic Toretto would be proud! Beyond that they haven’t revealed much else. Actually, wait; there is one more thing: red LED lights will now illuminate the engine bay when the owner unlocks the car as part of a “welcome sequence”. That is what you see in the teaser image above. Pretty cool but, if I think I would have rather had McLaren reveal more about the car’s performance. I guess we’ll have to wait for the Geneva Motor Show (March 7th, 2017) for that. Get a closer look at the teaser image just click the thumbnail above for a larger version. 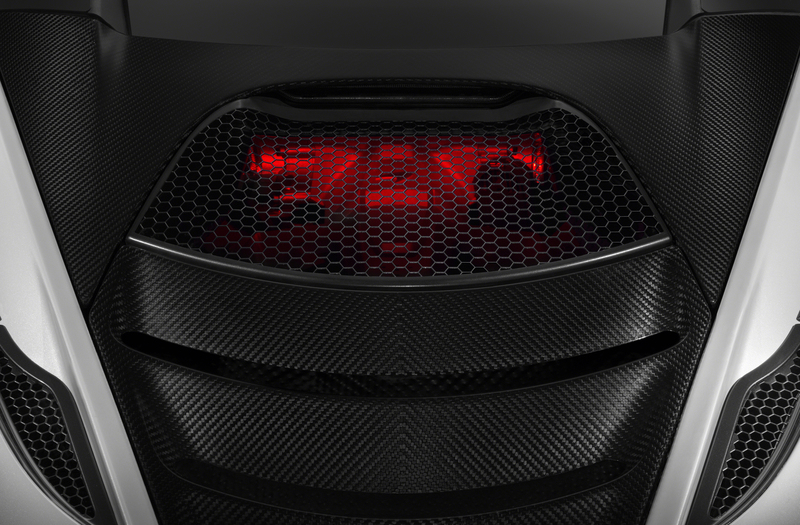 To read a little more about the M840T and its new glowy engine bay, check out the official press release below.